The Akai MPC Live takes the immersive production workflow and game-altering performance breakthroughs first introduced by the MPC Touch and ratchets up the stakes by adding standalone functionality. The result is the MPC Live, a portable MPC that's ready to dominate the studio and the stage. 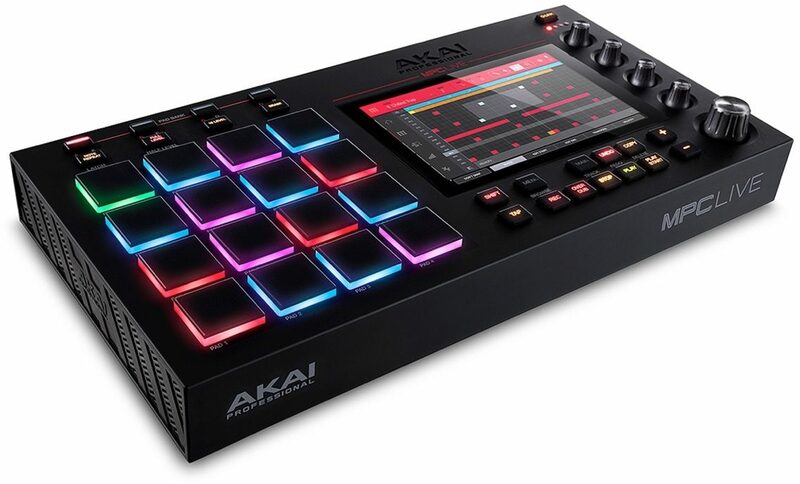 An argument can be made that the Akai MPC, with its classic workflow, legendary swing and instantly recognizable sound, is the most important instrument to be created in the last 50 years. The iconic MPC has given life to groundbreaking musical genres that have left an indelible mark on global pop culture. In turn, the massive technological and creative influence of our production machine has spawned numerous products released with the aim of repackaging that MPC magic. Following in the footsteps of greatness is never easy. But Akai did it. At the heart of the MPC Live is a beautiful, full color 7" multi-touch screen that puts boundless amounts of creative control at your fingertips. Simple gestures instantly become complex polyrhythmic drum patterns. Sophisticated effects automation can be crafted quickly and precisely. Your sound is at your fingertips. Of course, banging out drum patterns is at the core of any beat-oriented production workflow. The MPC Live features 16 amazingly responsive, velocity and pressure-sensitive RGB pads, perfect for getting the full expressive range out of your kits. Versatility is crucial for all producers. Being able to easily pivot from creator to performer means more people have the opportunity to see and hear your music. The MPC Live makes the process of transporting your studio creations on to the stage incredibly seamless by combining the power of a production centerpiece with the portability and rugged design of an on stage workhorse. Weighing in at just 5.5 lbs., the MPC Live is compact enough to fit into a small gig bag or backpack and light enough to effortlessly carry to the gig or another studio. But what makes the MPC Live truly unprecedented is nothing so portable has ever been this powerful. Packing 16 gigs of on-board storage, the MPC Live features numerous ways to take your beloved sample library and MPC sessions anywhere. Files can be accessed and transferred to the built on-board storage via the built-in SD card slot and/or two-port USB hub. The same USB hub can also be used for MIDI controller connectivity. If that's not enough room to win any storage war, the MPC Live also features a 2.5" SATA drive connector providing additional storage via installation of a fixed hard drive - SSD or HDD (sold separately). Want to cut more cords out of your life? The MPC Live can also be powered via battery (rechargeable Lithium-ION). Whether you prefer to go computer-free or not, it can't be denied that there are some fantastic sounding VST instruments and effects out there. For those times when you need your favorite plug-ins, the Live effortlessly goes from formidable standalone to high-powered MIDI controller, explicitly engineered to run the powerful MPC Software 2.0 on the computer in a DAW or standalone. A number of features added to 2.0 include: Audio track recording, improved time warp, enhanced Q-Link control, audio and MIDI drag and drop--all appearing on a graphical interface. The MPC has a well-earned reputation for sounds that hit hard and sound great, right out of the box. The X builds on that reputation. Pre-installed with 10 gigs of world-class sounds, The Vault 2.0 features samples and kits from top-notch sound design companies including Capsun Audio, MVP Loops, CR2 Records, as well as our own. "In creating the concept for the MPC Live we wanted to preserve the MPC feel and workflow that people love, but turn it on its head and put the best of what a modern touch-screen interface can offer. What we have now is the fastest MPC workflow ever," said Product Manager Dan Gill. The MPC Live is the pinnacle of lengthy research and development, detailed feedback from our passionate user base and the merging of the best technologies from across our product line. We proudly present the Music Production Center that embodies the best of past, present and future beat-oriented production machines. The MPC Live will be your studio centerpiece and live performance instrument of choice for years to come. This review has been selected by our experts as particularly helpful. "2 Months with the MPC Live and my entire outlook on music has changed"
Sound: Raw sounds tend to clip, so adding compression on every track and the master is a must in standalone mode. When working in controller mode, it is best to have some decent channel strip plugins or a solid preset of stock devices in your DAW of choice. When exporting songs in standalone mode at 320 kpbs, I have found the sound quality to be comparable to Ableton Live and FL Studio. Feature: Best features of the MPC Live are definitely the External Drive bay for expandability, the natural feel and color organization of the Pads, the amount of I/O on the Rear Panel, and of course, Q-Links. Ease of Use: As others have stated, there is definitely a steep learning curve with this product. I highly recommend a thorough manual read, in addition to watching as many videos about the MPC Live as possible. Once the initial concepts of Tracks, Keygroup Programs, and Sequences are learned, the songwriting process becomes easier. Quality: Extremely high build quality, solid as a rock. All metal chassis means this thing can take a beating, but obviously don't try to give it one. I have flown with mine, and after 2 months, the only real sign of wear is the matte finish rubbing off the corners from me not keeping it in a case. Value: Definitely worth the money, and to me the price tag was perfect. The Roland Fantom X6 that I mentioned as being the best music making tool I ever purchased was the exact same price at the time I purchased it, and I feel so much more confident about my investment this time around. Yes, it is a valuable product worth every penny you pay for it.. Manufacturer Support: Haven't had to go to Akai for anything yet except initial download software and hopefully it stays that way. The Wow Factor: Every person I have shown it to is amazed by the portability, size, and form factor, in addition to how much it can do. I definitely feel awesome knowing that very few people chose the MPC Live when there are so many other similar products out there. I think the real WOW factor is the Lithium-Ion Battery, which is why I left that out of my best features. The 5-6 hour battery life is what sets the MPC Live apart from the Toraiz SP-16, the Octatrak, the Maschine, Novation Circuit and every other Drum Machine. The true standalone power of a 7 inch screen for midi sequencing, audio editing, and mixing makes the MPC Live the best and only choice for any Hip Hop, R&B, and Dance producers, beat makers, or any sort of live electronic musician looking for a product to integrate to a non-computer based, standalone hardware setup. Overall: Overall, the MPC Live is the best music making product I have purchased since my Roland Fantom X6 in 2001. As a Music Producer, it is important to have an easy way to create, organize and manipulate sounds in a mobile format. The MPC Live is the solution to the most common computer-based producer problems because of its flexibility. The MPC Live can adapt to virtually any style or genre, and there are many ways to enhance your music making experience. Overall: As a gear head- I've had many samplers including the MPC2000XL which I regretfully sold a very long time ago- the concept of having the MPC standalone again is amazing!! 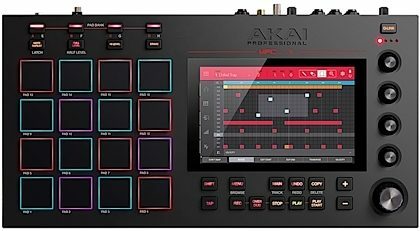 Especially in a time where I really wanted to get away from being tethered to a laptop or computer which has been the trend in the industry lately that I'm glad AKAI decided to step back from after the Touch and MPC Renaissance. The MPC is reborn-- the LIVE feels great!! Lightyears ahead of it's ancestors before it and IMO- even it's computer tethered counterparts today like maschine and push. Everything from the RGB pads to the super responsive touch screen/ with a ton of features literally at your fingertips just makes you want to play with it NONSTOP. Features like Pad Perform gets you making melodies right away without even having to plug in a Midi controller- definitely making it easy for you to get started on a song in no time. I've already sampled some my favorite drums machines and synths in my collection right to the unit- sounds fantastic!! It's been so refreshing to go standalone- I use it as my main sequencer to control my hardware synths. I couldn't be happier without the laptop. I'd also like to thank zZounds for helping finally get one- My customer service agent Fransico did an awesome job- thank you for all your help you are awesome!